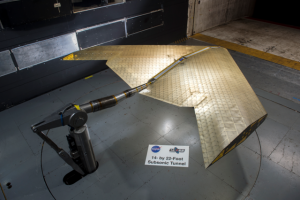 NASA and MIT engineers have built and tested a radically new kind of airplane wing, assembled from hundreds of tiny identical pieces. According to the engineers, the new wing can change shape to control the plane’s flight, thus offering greater flexibility in the design and manufacturing of future aircraft. According to the engineers, the new assembly system makes it possible to deform the whole wing, or parts of it, by incorporating a mix of stiff and flexible components in its structure. These tiny sub-assemblies which are bolted together to form an open, lightweight lattice framework, are then covered with a thin layer of similar polymer material as the framework. The result is a wing that is much lighter, and thus much more energy efficient, than those with conventional designs, whether made from metal or composites. Because the wing’s structure is composed mostly of empty space – featuring thousands of tiny triangles of matchstick-like struts – it forms a mechanical metamaterial. This metamaterial is said to combine the structural stiffness of a rubber-like polymer and the extreme lightness and low density of an aerogel. According to the engineers, each phase of a flight – takeoff and landing, cruising, maneuvering and so on – has its own, different set of optimal wing parameters. A wing that is constantly deformable could provide a much better approximation of the best configuration for each stage. The new wing is comparable in size to the wing of a real single-seater plane and could be easily manufactured. While the current version of the wing was hand-assembled by a team of graduate students, it can be easily accomplished by a swarm of small, simple autonomous assembly robots. The engineers used injection molding with polyethylene resin in a complex 3D mold to produce each part of the wing in a mere 17 seconds, which they say brings it closer to scalable production levels.